The quality of the program prescribed is obsolete without adherence. Trying to get somebody to stick to a new habit, which is what training is, can be quite difficult. A common reason why people who start training don’t keep it up past the novelty stage is that it takes too long. This can lead to the whole project being scrapped as opposed to doing the best you can with your current motivation, discipline, and time available. A simple way to increase motivation and discipline, while beginning to get into the habit of regular physical training is to assign short & simple workouts which are easy to complete frequently. Then once you have the “bug” and are “in”, more detailed and intensive programs can be followed. Perform the following for 1-3 rounds of 5-10 reps on each exercise. Pelvic Rotations: are a great way to work on the ability to separate the rotation of the lower and upper body during the swing which is important for correct sequencing and power production. They also work on hip mobility. Pressing the hands down through the golf club makes it easier to keep the upper half still, while the pelvis rotates. 2. 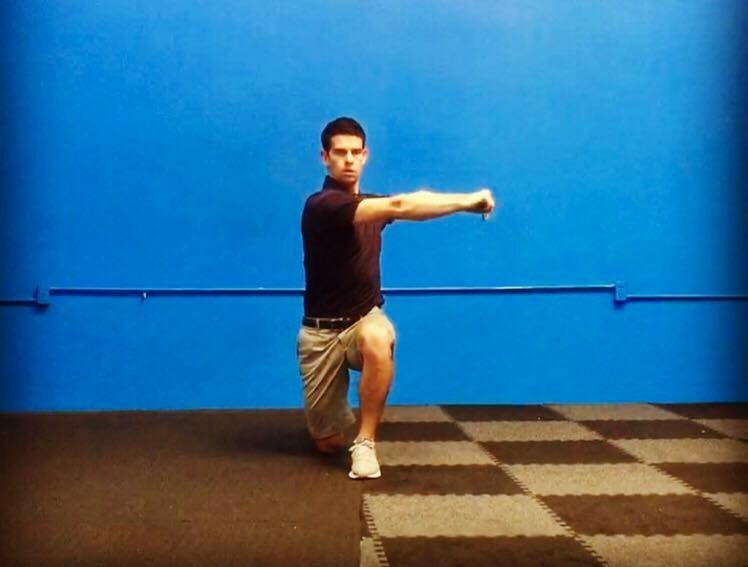 Half Kneeling Thoracic Rotation: These also work on separation, but in the opposite. The lower half stays stable, and rotation comes from the thoracic spine. Thoracic rotation is essential for an adequate shoulder turn. The half kneeling position will limit how much we can “cheat” with our hips while also challenging stability of the trunk and hips. 3. Hip Hinge: This is a great posture assessment tool and can teach people how to hinge from their hips, rather than rounding or flexing from their lower back. This is important for our address position in golf, and many exercises in the gym, especially deadlift variations, which are an excellent addition down the road. The golf club must remain in contact with your tailbone, between your shoulder blades, and if possible, the back of your head. Maintain a slight knee flex, and note how the movement is a hinge at the hips, not a squat. 4. Split Squat w/Rotation: works on lower body strength and stability in beginners, and may also help with mobility in the hips and thoracic spine. A strong, stable lower body is commonplace in big hitters, but often lacking in amateurs/physically weaker players. Lower yourself as far as you can under control, ideally hovering the knee of the rear leg just off the floor, while keeping the heel of the front foot glued to the floor. Most people cannot lower all the way at first, so go to wherever is manageable for now and aim to get lower over time. 5. Plank w/Shoulder Tap: These are a more difficult variation of the very popular front plank exercise, which also add an extra stability component for the trunk/core. It’s a great exercise to train trunk & shoulder stability. The goal is to maintain strict alignment from your ankles to your ears, and keep the hips still as you raise your hand to tap the opposite shoulder. Imagine a glass of water resting on your lower back which you don’t want to spill. If you find this too difficult at first try elevating your hands onto a bench or step. Please feel free to comment, and share with friends. Previous: Previous post: The Need For Speed: Why Club Head Speed Drops With Age, And What You Can Do About It. Looking to get started doing this to help with my mobility. You say to do 5-10 reps on each exercise on each round, do you need to do 5-10 on each side, i.e. on exercise 4 should we go for 5-10 on the right side too with left leg down? Yes, you are correct. If the exercises has two sides that need to done, consider the number of reps means to be done each side.